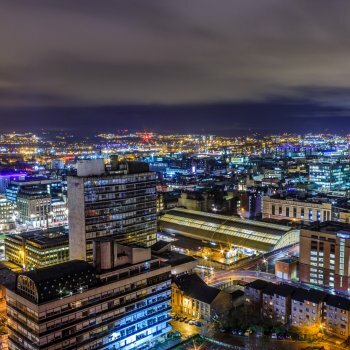 With a backdrop of concern about immigration and Theresa May’s recent hard hitting party conference speech Jamie Laird, Head of Market Intelligence at Hobsons examines how business schools can cut through the noise and reach prospective international students. Our 2015 International Student Survey heard from more than 45,000 prospective international students about what they value and how they choose where to study. Exclusively for the Chartered ABS, we carried out an additional analysis of the survey results for the 3,671 of those students who were interested in studying business and management in the UK. Here’s what we found. It will come as no surprise that competition for business students is on the rise. This year, we found that 32% of students who considered studying business and management in the UK ultimately decided to go elsewhere. The most popular destinations were the United States, which attracted 29% of students who chose not to study in the UK; Germany, which captured 12%; and Australia, at 11%. The driver for this seems to be employability. More than half of respondents (55%) told us that concerns over job prospects in their home country post-study were the main reason they rejected the UK in favour of another destination, while 36% pointed specifically to the UK’s lack of post-study work options as the main reason. So what can be done about this? Firstly, it’s clear to see the harm that the ever-stricter immigration policy is having on the UK higher education sector. That’s why we’re calling on Government to improve post-study work options for international students. Despite these challenges, there is much that business schools can do to improve their appeal to career-minded international students. In their responses students told us that links with industry, opportunities for work experience, and programmes that prepare graduates for the global workplace are all things that they look for when choosing where to study. These are all things that business schools have been doing well for years. Making sure there is reliable and robust data to demonstrate success is also crucial, making it more important than ever for business schools to track employability outcomes for international students and use this within marketing. Business schools again have an advantage here. 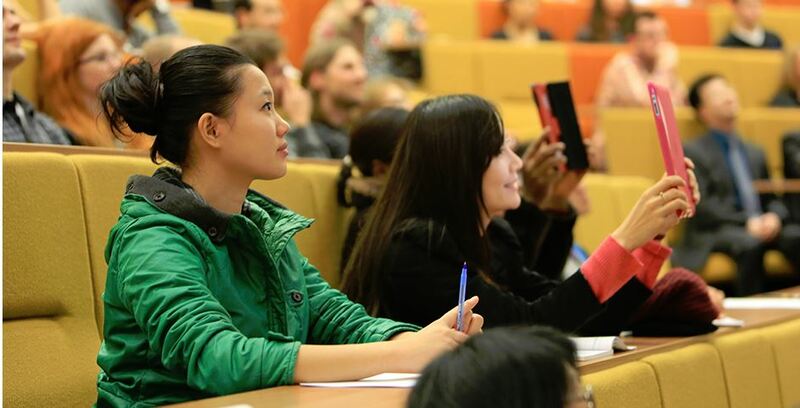 In our work with universities we speak to hundreds of students every week, so we focus our attention on understanding how the modern international student wants to be communicated with. 68% of business students expect a rapid response to enquiry. Alongside teaching quality and reputation, speed of response to enquiry is a major influence in deciding between institutions. 58% of business students expect a short reply within 24 hours and 54% expect a detailed reply within three days. 85% of business students expect a university to contact them regularly during the initial stages of their decision to study. 45% expect this contact to be at least weekly, while 24% would be happy with monthly contact. 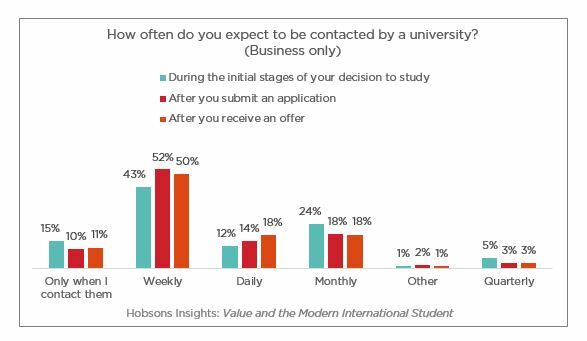 90% expect regular contact after submitting an application, with weekly being the preferred frequency for the majority of students once they have made an application or received an offer. With up to nine in 10 prospective students expecting regular contact, it’s crucial for business schools to develop a digital communications strategy that nurture prospects through the decision making process. 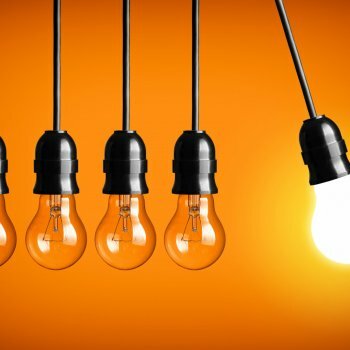 That means tailoring content, frequency and messaging to meet the needs of different groups, and using data and analytics to optimise communications and measure return on investment. We know from our previous research that 60% of international students apply to three or more universities, giving them a lot to think about when it comes to deciding on their future. Regular contact through digital channels – at all stages of the journey – can keep your institution front of mind and increase the likelihood that a prospective student will ultimately enrol. Download the full report Hobsons Insights: Value and the Modern International Student and follow @HobsonsEMEA for future research.